Perennial, loosely tufted grass from fibrous roots, rarely from short rhizomes; stems 60-150 cm tall, sometimes decumbent at the base. Sheaths smooth to rough or fine-hairy, often reddish-brown; blades 4-15 mm wide, flat to somewhat in-rolled, smooth to rough, rarely hairy, ear-shaped lobes at the leaf-bases 1.5-4 mm long, brown or purplish-black; ligules membranous, up to 1 (2) mm long. Inflorescence a spike 6-30 cm long, 3-7 cm wide, usually nodding, with 1 to 3 (5) spikelets per node; spikelets 12-20 mm long, with 3 to 6 florets; glumes 6-13 mm long, awned, the awns 6-25 mm long, the awns straight or curving; lemmas 8-15 mm long, smooth or hairy throughout, awned, the awns (10) 15-40 (50) mm long, strongly curving outward; anthers 2-3.5 mm long. Moist to dry sandy riverbars and sandy or gravelly meadows in the steppe and montane zones; infrequent in SC and SE BC; N to S AK and NT, E to NB and NS and S to ME, MA, PA, SC, TN, AR, TX, NM, AZ and CA. 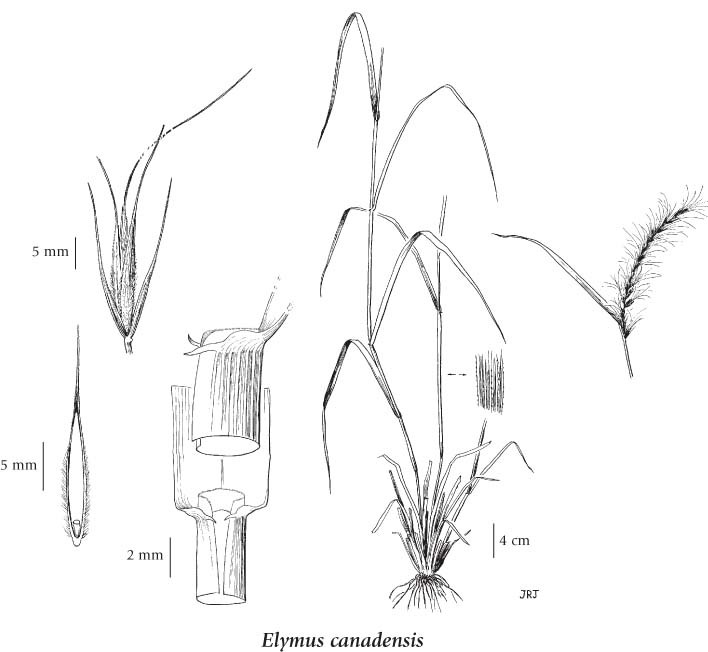 Elymus canadensis var. brachystachys (Scribn. & C.R. Ball) Farw. Elymus philadelphicus var. hirsutus Farw. 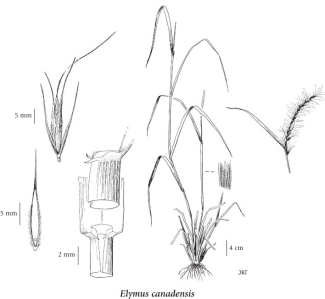 Elymus robustus Scribn. & J.G. Sm.